Hon. Judith S. Kaye will serve as Commencement speaker as the Syracuse University College of Law celebrates its Commencement on Friday, May 10, at 1 p.m. in the Carrier Dome. Kaye will receive a Doctor of Laws honorary degree from Syracuse University at its 159th Commencement exercises on Sunday, May 12. Kaye was the first woman to be named chief judge of New York’s Court of Appeals, a position she held from 1993-2008. Her 15-year tenure was longer than any other chief judge in New York State’s history. During her time as chief judge, Kaye reformed the courts and added specialized courts in a number of areas, such as domestic violence and mental health. Her innovations led other states to adopt similar reforms. Kaye was instrumental in establishing drug courts, which now exist throughout New York State and work to link defendants with treatment providers and monitor their health and criminal conduct, an approach that has been found to reduce both recidivism and addiction. Kaye was also crucial in getting the state courts to change how they deal with partner violence cases. Most counties now have separate integrated domestic violence courts, in which one judge may hear all matters that involve one family. This model closes gaps in the system and improves victim safety. She devoted time and resources to training judges to better understand the problem and how to deal with it. She is chair of the Permanent Judicial Commission on Justice for Children. She created the Adoption Now program, which produced more effective procedures for children in foster care and their families. For this, she received the U.S. Department of Health and Human Services’ Adoption Excellence Award. 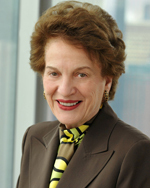 Kaye graduated from New York University Law School in 1962, going into private practice at Sullivan & Cromwell. She became the first woman to make partner in the firm of Olwine, Connelly, Chase, O’Donnell and Weyher. Kaye has authored more than 200 articles on subjects ranging from legal process and state constitutional law to juvenile justice and problem-solving courts. She retired from the bench in 2008, but continues as an active attorney. She is now of counsel to the firm of Skadden, Arps, Slate, Meagher and Flom & Affiliates. Among the awards she has received are the John Marshall Award from the American Association, the National Center for State Courts’ William H. Rehnquist Award for Judicial Excellence and the Margaret Brent Women Lawyers of Achievement Award from the American Bar Association’s Commission on Women in the Profession. Additional details may be found at lawcommencement.syr.edu.